With the September 22 release date just five days away, 20th Century Fox released a new clip for Kingsman: The Golden Circle. 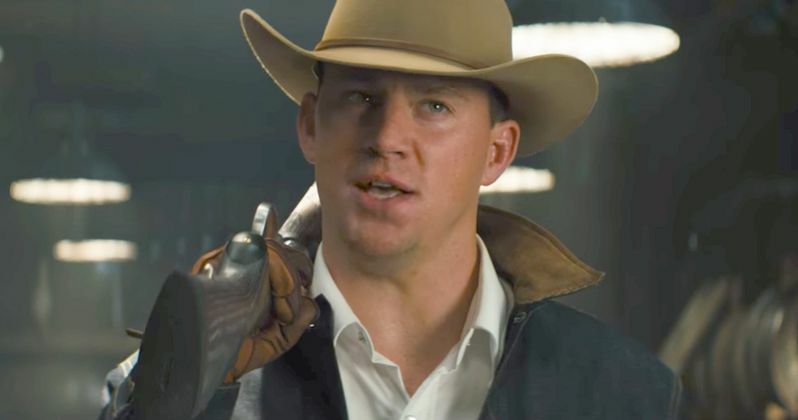 This scene shows the first interaction between Agent Tequila (Channing Tatum) and the Kingsmen agents Eggsy (Taron Egerton) and Merlin (Mark Strong). Tequila catches both Eggsy and Merlin in the act, as they try to break open a large barrel of whiskey at the Statesmen distillery. This follows an earlier preview where Merlin and Eggsy broke away from their tour of the distillery to try and find the secret entrance to the Statesman headquarters, and in this clip, instead of the entrance, they find Agent Tequila. This clip debuted on the 20th Century Fox YouTube, which opens with Merlin trying to take an axe to a massive barrel of Statesman whiskey, but it doesn't budge. Behind them, Agent Tequila comes trolling up, stating that his mama always told him that Southerners get their manners from the British, adding that it's a pity they didn't keep any manners for themselves. Eggsy retorts by stating that they received an invitation in the form of a whiskey bottle, telling this rifle-toting stranger that they're from the Kingsman tailor shop in London. However, Tequila already knows that they're much more than tailors, since they hacked through an advanced biometrics security system with nothing more than an "itty bitty watch." Unfortunately, this clip doesn't feature a new look at Harry Hart (Colin Firth), who comes back from the dead after being seemingly killed off in the first Kingsman movie. This mentor to Eggsy, who helped show him the ropes through his Kingsman training, was shot in the face at point blank range by the first movie's villain, Valentine, but even shortly after the first movie hit theaters, director Matthew Vaughn started hinting in interviews that he may be able to bring Harry Hart back from the dead. While we know he is seemingly alive and well in this sequel, we don't know exactly how this is possible. It is quite clear that he lost an eye in the ordeal, but considering he was thought to be dead, one eye isn't too bad of a sacrifice. While the Kingsman and the Statesman seem to get off to a rocky first start, we know they'll ultimately come together and work as a team. With their headquarters destroyed and the world held hostage, members of Kingsman find new allies when they discover a spy organization in the United States known as Statesman. In an adventure that tests their strength and wits, the elite secret agents from both sides of the pond band together to battle a ruthless enemy and save the day, something that's becoming a bit of a habit for Eggsy. Kingsman 2: The Golden Circle is the second exciting chapter in the Kingsman trilogy. The cast of Kingsman: The Golden Circle also includes Elton John as himself, Halle Berry as Ginger, Sophie Cookson as Roxy, Pedro Pascal as Agent Whiskey, Jeff Bridges as Agent Champagne, Edward Holcroft as Charlie and Julianne Moore as the main villain, Poppy. Kingsman: The Secret Service director Matthew Vaughn returns to direct, working from a script he co-wrote with Jane Goldman, based on The Secret Service comic book by Mark Millar and Dave Gibbons. Take a look at the new clip from Kingsman: The Goldan Compass below.